Outer Reef Yachts is building an Outer Reef 86 Deluxebridge, based on its successful 26 metre motor yacht platform, and will have the as-yet unsold boat ready for launch later this year. The 86 Deluxebridge concept seeks to build on the success of the 86 range offered by the builder, which also includes an 86 Motor Yacht and an 86 Cockpit model. The new boat is currently under construction and is scheduled to be delivered to a new owner’s port of choice in September 2015. Her length overall will be 26.30 metres and beam 6.4 metres. The boat’s draft is 1.67 metres and her displacement is 86.18 tons, with a fuel capacity of more than 11,000 litres, giving her a significant cruising range. One of the most attractive features of the yacht for many buyers is the Portuguese style bridge and hinged door through to the foredeck. Towards the aft end of the boat, there is a sliding door from the saloon to the rear deck and fixed windows in the superstructure with tinted safety glass for added privacy. Despite the 86 Deluxebridge's serious long-term cruising credentials, she has loose-laid furniture so owners can make the space their own. Outer Reef offers a number of optional upgrades, including 1,140hp CAT C18 engines, 55hp hydraulic bow and stern thrusters, Trac zero speed stabilisers, twin 38Kw Northern Lights generators and an extensive electronics package and AV system. There is also a custom décor package on offer so that owners can fit the boat out to their own personal standards. As well as a capacious lounge area and modern galley, the layout of the Deluxebridge will feature four spacious owner and guest cabins, with two crew cabins towards the stern of the boat, with a separate heads. Some changes to the layout can be made if the owner so desires, says Outer Reef. The Fort Lauderdale-based builder is also offering “substantial discounts” if the new owner allows the boat to be exhibited at boat shows. 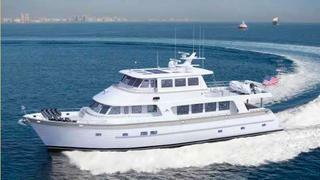 Outer Reef already offer a Deluxebridge 720, which has an LOA of 21.84 metres and beam of 5.63 metres, with three cabins.